Just What Is Propane Anyway? Have you ever cooked a juicy steak on a modern grill or used a portable heater? If so, you have probably used propane before. If you have ever wondered, “What is propane?” the answer may surprise you. 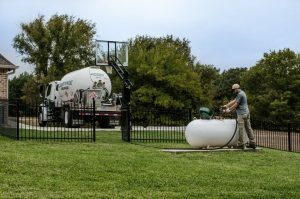 Propane gas is a byproduct of the petroleum or natural gas refining process, but it is most often transported in the form of a liquid and not a gas. Some low emission vehicles are fueled by propane, but it is most commonly associated with backdoor barbecues. Northwest Propane supplies the Dallas area with high enough quality propane to fuel vehicles such as buses. It is easily compressed into liquid for storage or transportation purposes. Propane burns cleaner than gasoline or diesel. It has a low boiling point which means the liquid vaporizes as soon as it contacts air. Purchasing large quantities is less expensive than gasoline or diesel fuel. Because propane is such an important source of fuel, it is easy to understand why companies like Northwest Propane are so concerned with providing the highest quality product they can to clients. Now you have a better idea of just what is propane and understand its relevance in the modern world. To purchase Dallas propane for your personal or commercial use, call us at 800-274-6121 to receive more information about ordering.